Logan worked as a communications intern for NCC's Saskatchewan Region in summer 2018. He holds a bachelor of arts from the University of Regina and is currently a second year law student at the University of Saskatchewan. While he would like to work in environmental policy in the future, he still hopes to find a day in the field whenever he can. 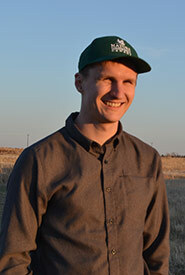 Off the job, Logan is an avid hiker and biker of Saskatchewan’s many valleys. Also, when he can manage it, you will find him rock climbing in the Rocky Mountains.